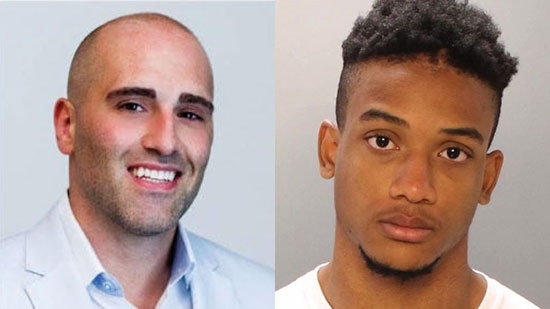 A memorial service is scheduled for the Philadelphia real estate developer who was stabbed and killed last week during an altercation with a bicycle delivery man near Rittenhouse Square. The service will be held Tuesday, 7/17, at 10 a.m. at the Radnor High School Auditorium. 37-year-old Sean Schellenger was stabbed in the back by 20-year-old Michael White at 17th and Chancellor Streets around 11 p.m. Thursday night. Schellenger was a passenger in a car and had gotten out to try to move traffic along. White was riding through on his bike delivering for Uber Eats. They got into some sort of argument. White pulled a large knife from his bag and stabbed Schellenger. White's family says the college student felt threatened and acted in self defense. He turned himself in on Friday night. He is charged with murder and possession of an instrument of crime. A man was shot and killed in his own home after answering the door in South Philadelphia. It happened just after 11:30 p.m. Sunday on the 2000 block of South Norwood Street. 41-year-old Richard Jackson was home alone when he heard a knock at the front door. When he opened it, he was shot point blank in the chest and collapsed to the floor. Jackson was rushed to Penn Presbyterian Medical Center where he died a short time later. His fiancée, Tia Wilson, said that earlier on Sunday at a cookout Jackson had gotten into an altercation with another man but they parted ways. Her mother Selina said, "We know who you are. So you might as well turn yourself in because you can't hide." The shooter is described as a tall, thin man who was wearing a white shirt and dark colored pants. Police are looking into nearby surveillance cameras. Philadelphia Phillies OF Rhys Hoskins will appear in tonight's Home Run Derby at the MLB All Star Game held at Nationals Park in Washington, DC. It begins at 8 p.m. on ESPN. Philadelphia Eagles QB Carson Wentz and longtime girlfriend Maddie Oberg got married over the weekend. The ceremony was held at the Lakehouse Inn in East Rockhill Township in Bucks County. The couple got engaged just two days after the big Super Bowl win in February. Teammate Zach Ertz and former teammates Jordan Matthews and Trey Burton were groomsmen. Training camp starts next Wednesday July 25th.